THE STORY - Thrust into an all-new adventure, a down-on-his-luck Capt. Jack Sparrow (Johnny Depp) feels the winds of ill-fortune blowing even more strongly when deadly ghost sailors led by his old nemesis, the evil Capt. Salazar (Javier Bardem), escape from the Devil's Triangle. Jack's only hope of survival lies in seeking out the legendary Trident of Poseidon, but to find it, he must forge an uneasy alliance with a brilliant and beautiful astronomer and a headstrong young man in the British navy. THE GOOD - The short running time? Geoffrey Rush? I'm grasping at straws here. THE BAD - Nearly everything. This franchise needs to end and lease telling anymore tales. I do not know why I let the early word get my hopes up. With the "Pirates Of The Caribbean" franchise getting steadily worse as the series has progressed, there had been early rumblings that "Pirates Of The Caribbean: Dead Men Tell No Tales" was the best film in the franchise since the first one. After seeing it, I have to ask...what were those people smoking? "Dead Men Tell No Tales" gets so little right and a whole hell of a lot wrong, furthering providing proof that this franchise is truly (And hopefully finally) dead in the water. Captain Jack Sparrow (Johnny Depp) is down on his luck as he is being hunted by an old enemy, the hate fueled Captain Salazar (Javier Bardem), who has along with his crew, escaped from the Devil's Triangle and is pursuing Jack by sea (They cannot travel on land). Meanwhile, Henry Turner (Brenton Thwaites), the son of William and Elizabeth Turner, is seeking the Trident of Poseidon, which legend says has the ability to break any curse. He intends to find it and free his father the ancient curse of the Flying Dutchman. Along the way, he encounters an astronomer named Carina Smyth (Kaya Scodelario) who is utilizing a diary given to her by her long lost father to follow the stars and find the Trident as well. With Hector Barbossa (Geoffrey Rush) leading Salazar towards Jack and all of the characters searching for the Trident to help themselves with their own predicaments, they are all also being tracked by the British Royal navy, headed by Scarfield (David Wenham). We need to first start off with the obvious which is the fact that this film is just as bad as the last in the franchise, "On Stranger Tides." Obviously, the first one is the best, while the second one is a solid blockbuster hurt by a cliffhanger ending and the third is a mess with some decent moments sprinkled throughout. As much as I criticize him for going to over the top with his films, Gore Verbinski at least made these films visually interesting and focused a lot on the characters and story. 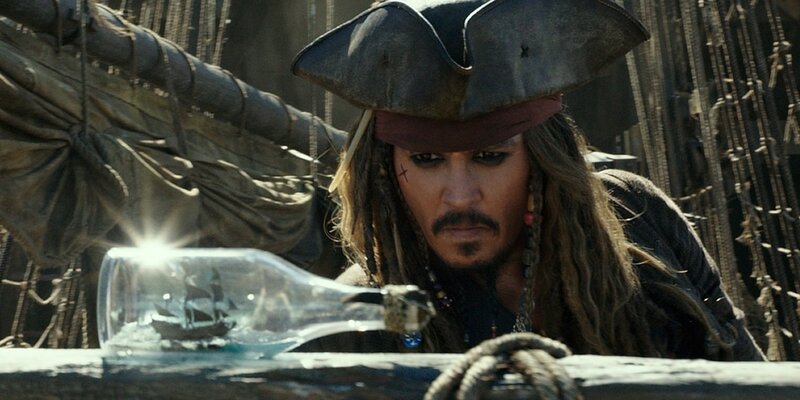 With "On Stranger Tides" and now "Dead Men Tell No Tales" it feels though as if the writers/directors are merely trying to give us the continuing adventures of Captain Jack Sparrow instead of a story that is actually worth telling. This is evident in every horrendous, amateurish and childish line of dialogue or in Johnny Depp's once great, now caricature performance. Believe it or not, Bill Nighy's well thought out villain, Davy Jones, was a series highlight for me in terms of character, performance, and Academy Award-winning visual effects. Even the villains in the last two installments have failed to live up to the expectations set by Gore Verbinski with the first three films. Almost effectively proving why "On Stranger Tides" should not exist, the story of "Dead Men Tell No Tales" centers around Henry Turner's quest to free his father, William Turner, from the curse of the flying dutchman. Brenton Thwaites is as wooden and uncharismatic as they come here, a far cry from the heart-warming performance given by Orlando Bloom in the original trilogy. He's just yet another pretty boy face plucked from obscurity (I guess he was also in "Gods of Egypt," which isn't saying much) which Disney executives are hoping audiences will swoon over much as they did Orlando Bloom. The story of Henry and Will should have been the focus all along since the end of the third film in the franchise (Or rather, it should have just ended after that) but what makes "On Stranger Tides" and now "Dead Men Tell No Tales" at least worth a watch is the character arc of Captain Barbossa. Not because it's any good. We've already established that pretty much nothing about this film is good. Rather, where Johnny Depp appears to be phoning it in now, Geoffrey Rush still seems to be reveling in the limelight with this fascinating character. He too is teetering on caricature with this part in the franchise but at least it's not the worst part of the movie. Javier Bardem, on the other hand, is simply not believable as the villain of this movie. He's meant to be scary and hell bent on revenge against Captain Jack Sparrow but with no detailed backstory or complex motivations like Davy Jones had, Bardem's Captain Salazar falls completely flat. Speaking of flat, go back and watch the first three films of the series and pay attention to the cinematography. Now watch "Dead Men Tell No Tales" and you'll see a huge difference. Lacking in almost every department on a technical level, "Dead Men Tell No Tales" lacks much of the intricate set design, colorful cinematography, dazzling visual effects and detailed makeup of its characters. Even the score by Geoff Zanelli, which has the luxury of building off from the iconic themes created by Klaus Badelt and Hans Zimmer, cannot manage to create a single memorable note or tune. So what are we left with? Does "Dead Men Tell No Tales" have any positive qualities? Even though she is saddled with poor dialogue and forced plot mechanics, Kaya Scodelario does make an impression as the smart and capable Carina Smyth. Another positive would be the film's running time. With an average running time of 149.25 minutes, the franchise tends to clock in on the longer side of things which is why it's a breath of fresh open sea air that "Dead Men Tell No Tales" manages to tell its story with the shortest runtime of the series, clocking in at 129 minutes. We are thankful that the film is short compared to the others because, quite frankly, I'm not entirely sure how much more of it I could have possibly suffered through. My hope is that audiences can come to the realization that this franchise is as dead as they come and hopefully there are no more tales to tell.